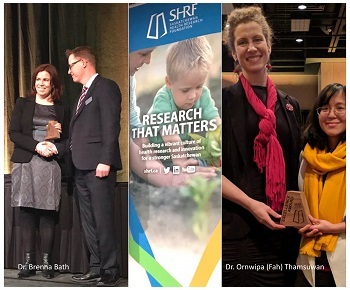 CCHSA associate member Dr. Brenna Bath and postdoctoral fellow Dr. Ornwipa (Fah) Thamsuwan were award recipients at the SHRF Santé awards held Thursday December 6 in Saskatoon. Dr. Bath won the SHRF Impact award for her research project titled "Advancing interprofessional primary health care services in trural settings for people with chronic low back disorders: investigation of a physiotherapist and nurse practitioner intervention delivered through telehealth". This project investigated models of care for residents of a rural community with low access to physiotherapy, including a novel interprofessional telehealth model of care. Dr. Bath and the team compared diagnostic and prognostic assessments, patient and practitioner satisfaction, and conducted an economic evaluation. This project has developed into a broader program of research developing and evaluating enhanced musculoskeletal care for those in rural communities. Dr. Thamsuwan won the Top Research Fellowship Excellence Award (Socio-Health) for her project titled "Take a load off: an ergonomic evaluation of exoskeletons for Saskatchewan farmers". An exoskeleton is a structure that allows the back and limbs to be supported and could be a solution to minimize the stress of back bending. This study will investigate the biomechanics and usability of a prototype exoskeleton for use by farmers during work. The result of this study will enable us to better understand how an exoskeleton might assist farmers and ultimately be an appropriate prevention strategy for back pain among farmers. Dr Thamsuwan is supervised by Dr Catherine Trask (CCHSA) and Dr Stephan Milosavljevic (School of Rehabilitation Science). Congratulations Drs Bath and Thamsuwan!